“I think we had a pretty solid run, I never felt like our records got bad, and that’s all you want. We did four records in five years…which is pretty good. It’s what you want out of a band,” said Landis Wine, former White Laces vocalist/guitarist as he sipped coffee on a recent afternoon at Patrick Henry Pub. 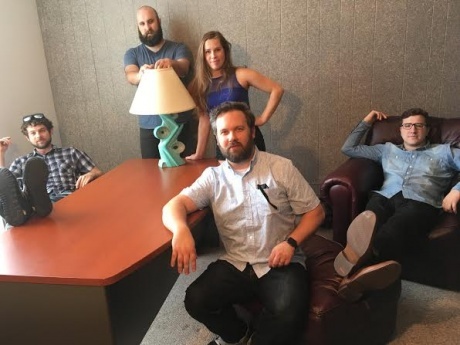 When beloved RVA rock/electronic group White Laces announced in November that their time of entertaining crowds with their loud, eclectic sound had come to an end, it sent a shock through the local music scene. For the last six years, Richmond music lovers watched White Laces grow and evolve their sound from loud fuzzy shoegaze to electronic to most recently a poppy vibe through four albums and when the announcement came via Facebook just three months after the band dropped their fourth record, No Floor, fans were left with a hole in their hearts. RVA Magazine contributor and member of Clair Morgan Shannon Cleary even published a tribute to White Laces on his Tumblr page which you can check out here. Luckily, for fans of their music, out of the ashes of White Laces, former members Tori Hovater (vocalist/piano) and Wine have decided to push forward with a new project, one that’s completely different from anything the band has done before. For the last year, the two have been toiling away on new material to form a new band called Opin under the Egghunt Records label, the same label White Laces was on. They’ve parted with previous White Laces members, Jimmy Held and Jay Ward, but added fellow RVA musicians Ethan Johnstone of Night Idea on drums and Jon Hawkins of Navi. Opin will make their debut at Hardywood this weekend with an album to follow in March. The new band actually began to take shape after White Laces had put out their last record, No Floor, and were in between touring. Hovater said the band initially ended to release it as tour material between albums to bring on their summer tour, but ended up bringing it on their tour this past fall. After they finished the last show on their recent tour, Wine said he pretty much knew it was the final chapter in White Laces’ book. The band didn’t have a sit down either to talk about if they should continue or call it quits. Held and Ward have gone on to pursue other musical ventures as well. Held is playing drums in Bad Magic (Julie Karr, Tim Falen) and both Held and Ward are collaborating on another project together. Wine and Hovater started working on a series of demos around December 2015 and by February, the duo began recording around various studios and spaces for what would become Opin’s debut self-titled album. Heading to Philadelphia, the two went back to their longtime producer Jeff Zeigler, who also worked on No Floor and Trance, to record parts of the album at Uniform Recording as well as tracked drums with Chris Ward (St. Vincent). The duo also recorded different parts of the album at Hovater’s house, Sound of Music Studios, The Richmond Ballet, and the University of Richmond. The coolest part about Opin is Wine and Hovater recruited a cadre of local musicians to add their talents to the album. Lindsey Spurrier of Hot Dolphin provided some background vocals, Dash Lewis of Gardener on modular synthesizer, No BS! Brass Band’s David Hood added saxophones on the record, and Hannah Staniford of the gamelan ensemble Rumput is also featured. And the duo said having this hodgepodge of Richmond musicians piece-meal the album together was really fun. Opin wrapped up their 10-track album in June and had it mastered in New York with Joe LaPorta (David Bowie’s Black Star, Young Thug, Run the Jewels). Hawkins and Johnstone aren’t featured on Opin’s debut record, but will be playing the music at the live shows. Describing their new sound, the two said they aren’t placing their sound into one particular genre. Wine said there are some elements of hip hop, and samples from YouTube and other sound engines that he downloaded. But for fans of White Laces’ music, don’t worry there are still some elements that crept into this record. “I think it draws from the more pop aspects of White Laces, it takes the catchy melodies that we had going on and putting them in a different setting,” Hovater said. Opin will play on Time is Tight on WRIR tonight but the first official Richmond show will be held at Hardywood Saturday the 28th followed by the album release on March 24th. Once they play their debut show, Wine said Opin will hit the road to spread the word on the new band. “I’m really excited to use the record as a spring-board to get out there,” he said.